A problem with these reports is they do not share with parents information that can be used to help their children improve their learning. What they share is information that is helpful to rank their children with respect to the other children in their classes. They are essentially an autotopsy of learning, rather than a document which can be used to help students improve. A child who does "poorly" is rarely given sufficient advice to help them improve via their report card. Most comments from teachers are of the "what did David do wrong" variety, rather than "David should do x to help improve learning." A child who does well on their report card is given a free pass, and rarely pushed to extend themselves. The comments you put on your report cards should be ones that help students improve. 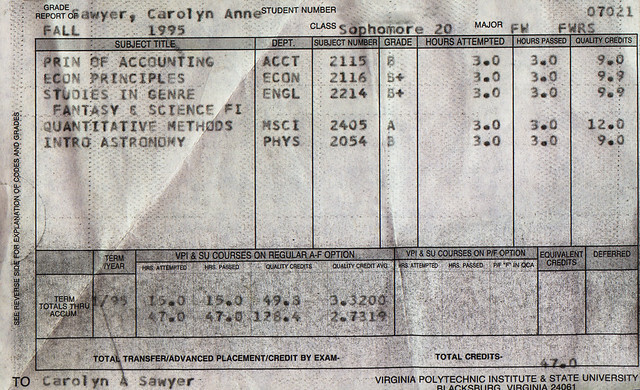 Canned report card comments are a waste of time! If teachers do not have time to give appropriate comments for each of their students, that points to a systemic problem with classroom size (and workload) and that can’t be rectified by adding useless comments to report cards that teachers can just select. I don’t think that online grading systems are the answer either. These lead to situations where teachers are forced into an unhealthy practice (grading everything students do) just so parents can always keep on top of the "progress" of their students. It is counter to the purpose of formative assessment to include it in an overall summative grade, and it is counter to the purpose of a summative assessment to include everything students do. Students also need a bit of freedom from their parents in order to experience this learning process themselves, and having their helicopter parents whirring around all the time checking in on them is counter-productive to them developing their own sense of independence. We’ve used student led conferences at our school, which are an opportunity for students to show to parents directly, the results of their learning, based on portfolios our students have constructed. We are hoping to eventually have these portfolios be online, and I’d like to see the specific assessments students have done linked from their report cards. These experiences are far more valuable, both for "strong" and "weaker" students. They do have issues; not every parent takes the time to come and see their student’s work, and not every student is able to adequately explain how well they did. I wonder what a report card that was sent home that just listed student’s (apparent) strengths and weaknesses would look like? Could you send home information that helps students improve, rather than information which helps them be numbered? Could we design an electronic report card that gave far more information than our current ones do? What would a report card with each assessment criteria for the year, and how well our students did on each look like? Would that be too over-whelming? What if we sent home a link to an eportfolio for each student, with suggestions and comments for how to improve attached to each assessment the student does? What would happen if we gave students more ownership (perhaps with some oversight to start) over how they reported their learning to their parents? I don’t have the answer to what the report card of the future should look like, but I do know that our current report cards need improvement. I’ve been thinking a lot about reporting during the job action and the thought that keeps coming back to me is, "I could create better reports if I had fewer students." It’s definitely difficult to conference with and provide specific feedback to many students at once. When I read about personalized learning, my reaction is very similar. Customizing instruction, assessment, and reporting would be a much different experience with classes of 15-18 compared to the classes of 27-31 I currently teach. I love the setup of parent-teacher conferences, but poor turnout is always a disappointment. Many families have other commitments on the nights we host them and I simply don’t have time to meet with 200+ parents on various days after school. I often wonder if, instead of these meetings, it would be more beneficial for teachers to have the day to prepare more detailed report cards. I have been working on developing more meaningful interim reports, as we have not had conferences this year, and am hoping to use the format to print report card attachments when the job action is over. A typical secondary report card doesn’t explain how a student is succeeding and where he or she can improve. I wonder if, in the culture of percentages, parents and students will value the comments. Only time will tell! 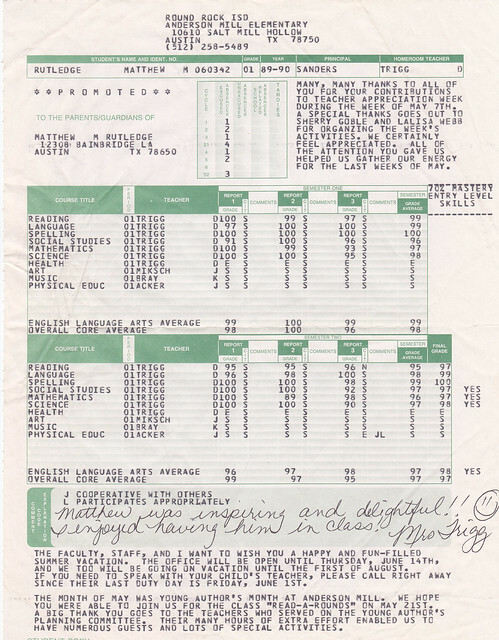 I’ve been blogging about report cards at meganjakse.blogspot.com and would love some feedback if you have time.